It's hard to believe there are more than 200 golf courses, and several dozen grand golf resorts, in the greater Scottsdale area of Arizona, but it's true. And that in itself presents us vacationing golfers with a major problem: how the heck do we decide which ones to play? It's not easy. My solution was to check out, come up with, a list of the "Top 25 Golf Courses in the Sottsdale and its surrounds. Okay, so some of the 200 are less than perfect. That being so, I've done my best to put together such a list. The choices are mine, and you may or may not agree with them. Never mind. It's a place to begin, right? So, when planning a golf outing, we need to know where to play and where to stay. That means you need a to know how to find the best golf courses in Scottsdale, and that’s why I thought you’d find this list of what I consider to be the Top 25 Golf Courses - plus a couple extra - in the greater Scottsdale area helpful. Arizona has long been one of the world’s top golf destinations, not only because of its wealth of golf courses, but also because of the weather: it’s predictably good most of the year round, and you can count on more than 300 days of sunshine annually. 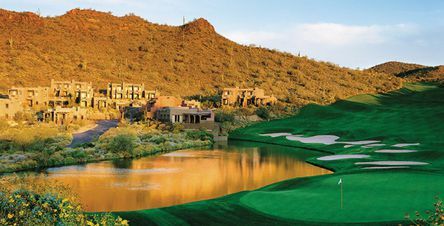 Add to that more than 50 grand hotels and resorts, all catering the golfing public, and all within an easy drive of the airports, and you can see why Scottsdale is such a popular golf destination. The closest airport is Phoenix Sky Harbor International Airport. The airport is served by Delta, American Airlines, US Air, United, Northwest and several others. Maybe Scottsdale is not for you? Okay, so here are a whole lot more ideas for your golf getaway. You might like to consider one or more of these all time favorites: Scotland, Florida, the American Southwest, Bermuda, the Bahamas, all over the Caribbean and Mexico and many more. For up-to-date golf travel news and information, don't forget to Subscribe to my weekly Newsletter.